The finished inukshuk ready to stand watch for centuries. Photo of the Northwest horizon at midnight from HMP Base Camp. Inukshuk is under last 's' in 'pass'. 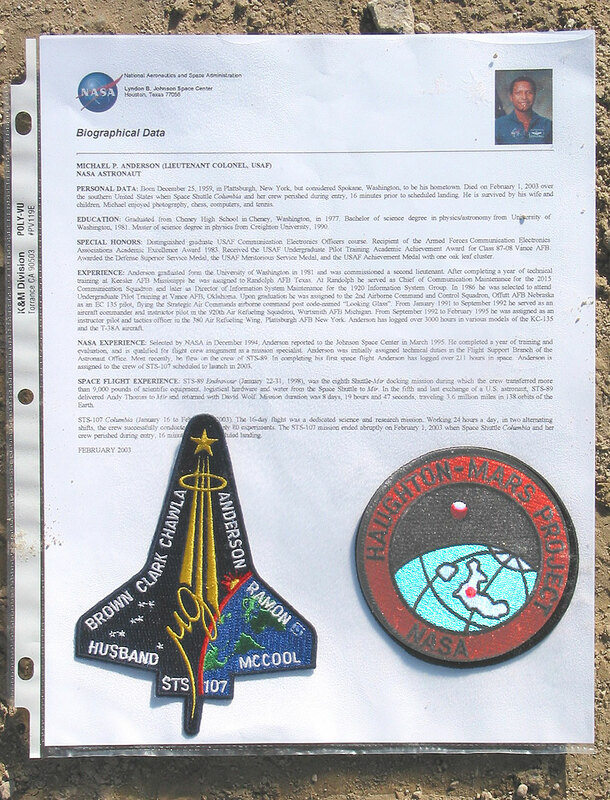 Jar containing Michael Anderson's official biography, with STS-107 and NASA HMP patches shown. Michael Anderson's biography and patches. Reverse side of Anderson's biography. Inukshuk team (L-R) Keith Cowing, SpaceRef; Pascal Lee, SETI and Mars Institutes; Steve Hoffman SAIC/NASA JSC; Matt Bamsey, CSA; Bill Fox, writer; Joe Amaraulik, Guide, Resolute Bay. 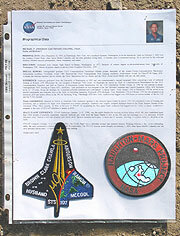 Jar containing Michael Anderson's official biography, with STS-107 and "Enterprise" patches shown. Michael Anderson's Inukshuk as seen from HMP Base Camp. Today I went out on an unusual traverse. Leading the way was HMP PI Pascal Lee. Following him was Qimmiq our polar bear guide dog who managed to keep up the pace most of the way. I was next followed by Steve Hoffman from NASA JSC, Bill Fox, a freelance writer, Matt Bamsey, a CSA Intern working on the greenhouse, and lastly, Joe Amaraulik, Deputy Base Camp Manager and local Inuit guide. We headed east at first, crossed a small ravine with a stream, and then headed to the northwest across a broad flat plain called von Braun Planitia. Only a few, lone, large boulders marked the way. We were heading back across the path that the HMP's Mars-1 Humvee Rover had made just a few days back as it completed its inaugural traverse across Devon Island. After 4 kilometers or so we arrived at Marine Peak. This feature was named after the U.S. Marines and the support they have provided for the HMP over the years. To the northeast of Marine Peak is a small rise atop which are some large, angular rocks. This was our destination. From here we could look back to the south and see HMP Base Camp. 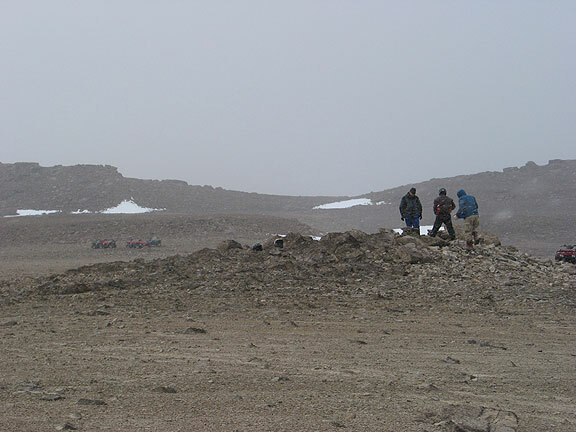 Indeed, on their traverse across Devon Island just a few days ago, the team driving the Mars-1 rover got their first sight of Base Camp from this point. Our task was a somewhat solemn one. We were here to erect a memorial to Columbia astronaut Michael Anderson. Two memorials have already been erected by members of the HMP Team. 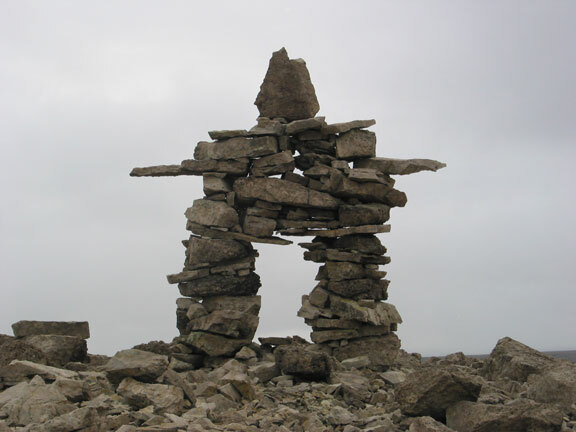 The memorials take the form of an inukshuk, a stone sculpture in rough human form used by the Inuit to mark territory. These stone structures serve as reference points for those who traverse this desolate place. As we establish these memorial inukshuks, we do so for the very same reason the Inuit do: to aid in future exploration - in this case, of Devon Island. As such, these memorials will show the way for future explorers. Visit the Space Shuttle Columbia Inukshuk Memorials. The order in which features were named and given an inukshuk, has been chosen more or less at random. The first location to be named was "Point McCool" - after Willie McCool. This is the point where Mars-1 rover crossed the "Endurance River" for the first time. The next location, also named by the Mars-1 traverse team, was "Point Clark", named after Laurel Clark. Point Clark is the landmark that signals a turn east from a large, as yet unnamed valley, to head south towards HMP Base Camp. The third location, the one we were here to establish, was to be called "Anderson Pass". The whole idea started a month or so ago. I was sitting in a press conference at the Department of the Interior in Washington D.C., where Columbia Peak was formally dedicated to the crew of STS-107. This peak is adjacent to Challenger Peak on Kitt Carson Mountain in Colorado. Astronaut Scott Parazynski had come up with the idea of naming an adjacent peak in honor of the Columbia crew. 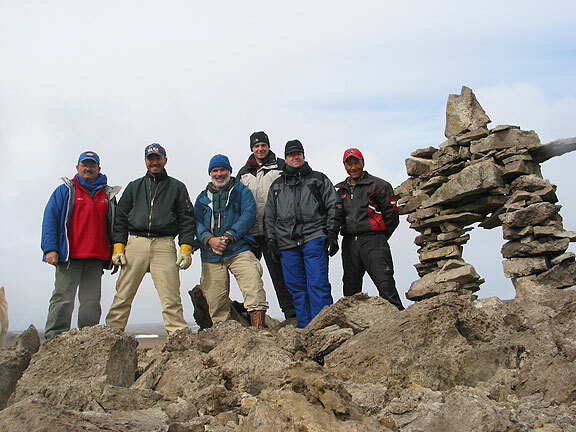 Parazynski recalled how he and some friends had climbed Challenger Peak some years ago and had erected 7 small stone piles - or cairns - in memory of Challenger's crew. As I heard this an idea hit me: to mark significant navigation points on Devon Island with inukshuks and dedicate one to each member of Columbia's crew. As I headed out of the Interior Department's press room, and back to NASA HQ to cover another event, I made a quick call to HMP PI Pascal Lee. Pascal approved the plan. A few minutes later, back at NASA Headquarters, I mentioned the idea to Scott Parazynski, NASA's Associate Administrator for Public Affairs, Glenn Mahone, and NASA Administrator Sean O'Keefe. They all liked the idea very much. Flash forward to today's traverse. As we walked up to the site, I took a series of photos, which will eventually be stitched together to form a 360-degree panorama. This will be done at each location. After that was done, I joined everyone else in our group in the search for the right types of rocks needed for the inukshuk. Our architect on this inukshuk was the same used on the previous two: Joe Amaraulik. Joe began by building the feet. Soon we found some long flat rocks to juxtapose so as to form the hips. Next was the torso, then the arms. Finally, the head. It took us an hour to complete this task. Once done, we stood back to admire our work. After some photos, I placed a small glass jar between the feet of the inukshuk and covered it with stones. This will be done with all of the memorials. 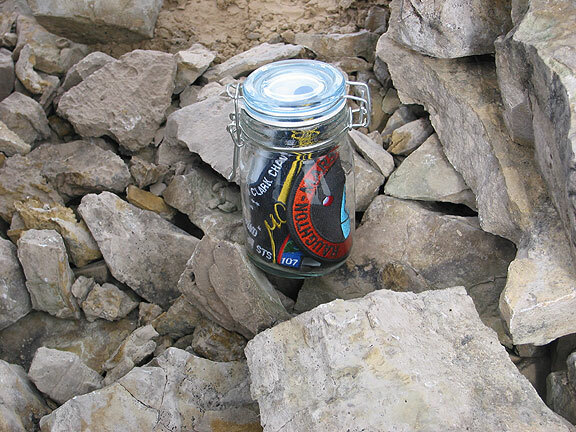 Inside this jar is a printout of Anderson's official astronaut biography from a NASA website. 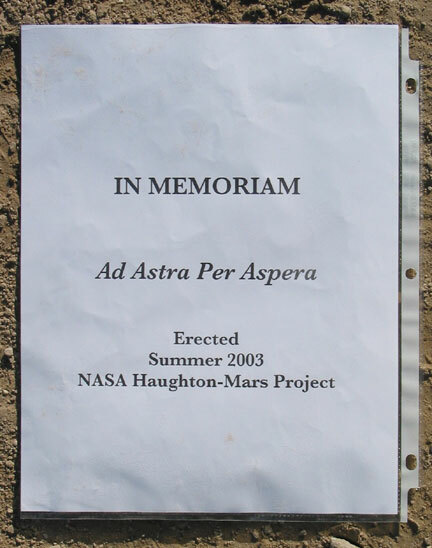 There is also a sheet of paper, which says: "IN MEMORIAM; Ad Astra Per Aspera; Erected Summer 2003, NASA Haughton-Mars Project". Wrapped around this folded paper are a STS-107 mission patch and a patch from the NASA Haughton Mars Project. The HMP patch is only bestowed (once) on those who have come to Devon Island to participate in the project's research. In essence, it must be earned by deeds. Michael Anderson never set foot here - nor did his crewmates. However their service - and sacrifice elsewhere - certainly earned them this patch. I never met Mr. Anderson. Like millions of people, I only learned about who he is - and how he came to be aboard Columbia - after his death. He was only 4 years younger than I am. As such, we shared much the same childhood - growing up in simultaneity with America's space program. He was 9 when Apollo 11 landed on the moon on this day in 1969. I was 13. We both dreamed of being an astronaut - he managed to make that dream come true. I wanted to have some thoughts in my head about the person we'd memorialize today such that I could tell others about this person. In doing some research before I went out this morning I was struck by the fact that every newspaper story about Michael Anderson mentioned his obsession with science fiction TV shows while he was growing up. I shared this affliction. Star Trek was one show that always seemed to get mentioned as those who knew him recounted the things that influenced his life. There was some sort of resonance between his life and mine. As such I decided to take his memorial with us today. 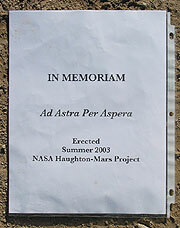 To honor the memory of the seven astronauts of Space Shuttle Columbia's last flight, and at the suggestion of our colleague Keith Cowing of SpaceRef, the NASA Haughton-Mars Project (HMP) has established seven astronaut memorial sites on Devon Island, in the Canadian High Arctic, during the summer field seasons of 2003 and 2004. Each site was chosen for its special significance in the NASA HMP's analog exploration program near Haughton Crater, and is marked by an Inukshuk, a traditional Inuit "Stone Person". The Inuit erect Inukshuks to mark land and to guide and comfort travelers on perilous journeys across the Arctic. 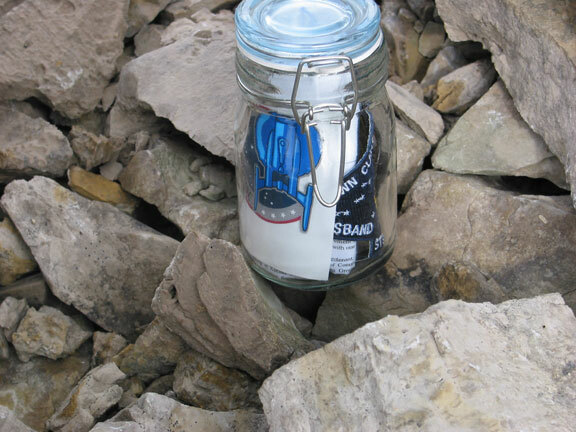 At the base of each our Columbia Inukshuks, a sealed container was placed, enclosing the following in memoriam items: the bio of one of the seven Columbia astronauts, a patch of the crew's shuttle mission, and a patch of the NASA Haughton-Mars Project. It is our hope that the Columbia Inukshuks on Devon Island will help bring peace to all those who continue to miss these seven astronauts, and will help inspire and guide future generations of space explorers who will journey to the Moon, Mars and Beyond. I just happened to have a decal given to me by Mike Okuda, senior illustrator and technical consultant on Star Trek at Paramount Studios. At the time, I was not sure if Michael Anderson watched the latest show "Enterprise" but assumed that he did. As such I dropped that sticker into the jar as well. I would learn later that day that Anderson had interacted with some of the cast of "Enterprise". When I learn more about this I will add it as a postscript to this journal entry. Once things were completed, everyone instinctively seemed to pause for a moment. No words were spoken, but everyone knew why we were there. After posing for photos everyone lingered for a bit, and then headed back to the ATVs - except me. I stayed a little longer, making certain that I got enough photos to allow people to get an idea of the magnificent desolation (can't think of a better phrase, Buzz) to describe the locale. Then, feeling like I should say something, I said aloud "well done Mr. Anderson" to the inukshuk and then walked briskly toward my waiting comrades. Upon arrival at Base Camp, Steve Hoffman came up to me with a big smile on his face and said "you can see it from Base Camp". 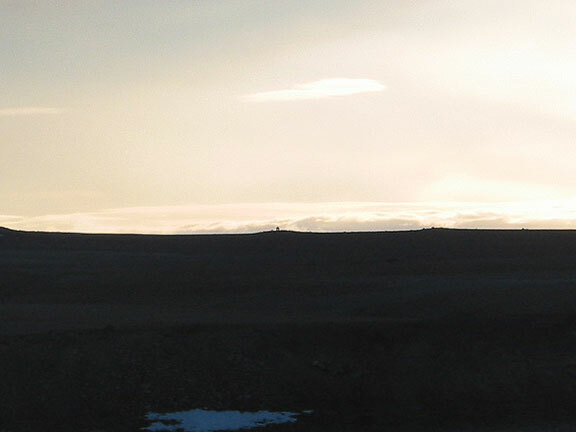 Indeed, when I looked to the horizon I could see the inukshuk standing there. A small magnifying handscope and I could make out its features. This inukshuk now serves not only as a sentinel marking the last turn towards our Base Camp, it also serves the dual purpose as a sentinel at the edge of the unknown beckoning us onward. How cool. I asked Joe Amaraulik if anyone had ever figured out how long these structures would last. He said he wasn't sure if they had been dated but that there were some that had been in place for many centuries. As for how long this one, which we had just built, would last, Joe (a man of few, but well-chosen words) said "forever". In other words - the next ice age. Given the sheer mass of the structure, and the slow manner with which things change here, this inukshuk may well be standing 500 years from now. That should be long enough. Maybe someone serving on a starship will think to visit it.